I arrive at Nitobe Memorial Garden ten minutes before the scheduled interview time in order to give myself the opportunity to walk around and take in the gorgeous, meticulously arranged landscape. It’s a hot late spring afternoon, and the canopy of maple trees enclosing the garden’s trails provides welcome relief from the heat. Cherry trees, azaleas, and irises, all brought from Japan, also form part of the scenery inside this walled corner of campus. Nitobe is a totally unique space within UBC, as a traditional Japanese Tea and Stroll garden considered by experts to be one of the finest and most authentic outside of Japan. Walking along the path, one comes across landmarks such as the Island of Eternity, a turtle-shaped rock statue (turtles represent longevity) in the reflecting pond (which is teeming with koi fish), completed by other rocks representing the turtle’s flippers, head and tail. The whole garden is filled with symbolic representations of traditional Japanese philosophy and spirituality, which, combined with the imported and traditionally manicured flora, create a truly genuine Japanese garden. 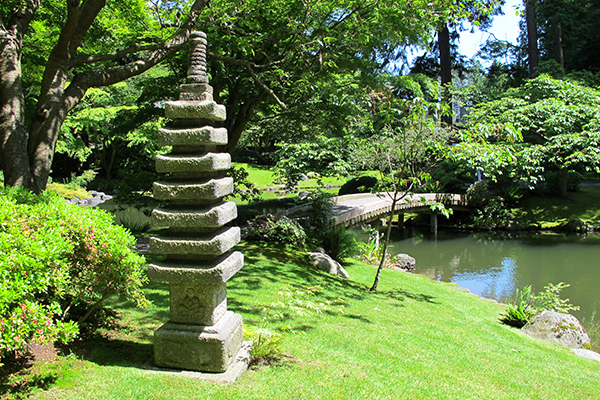 Nitobe Memorial Garden on a sunny spring afternoon. As I continue on the trail, I come across Nitobe’s venerable curator, Ryo Sugiyama, who is busy working on a pine tree. Ryo has been Nitobe’s main curator and horticulturist since 2010, and maintains Nitobe with traditional Japanese pruning methods to ensure it remains as authentic as possible. He points me towards the westernmost outer fence of the 2.5-acre garden when I ask him where to find my interview subject. I make my way past several lanterns adorned with zodiac and lotus symbols until I reach the area, but I don’t see anyone. That’s when I detect movement near the fence, and see a stick protruding from a tree… and someone holding it. 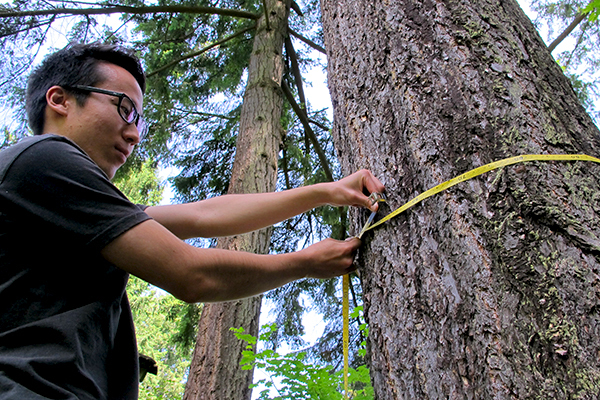 Yu Ozaki is deep in concentration, diligently measuring the branch length of a western hemlock as I approach over the mossy ground. He turns around and sees the camera hanging from my neck, and greets me warmly. 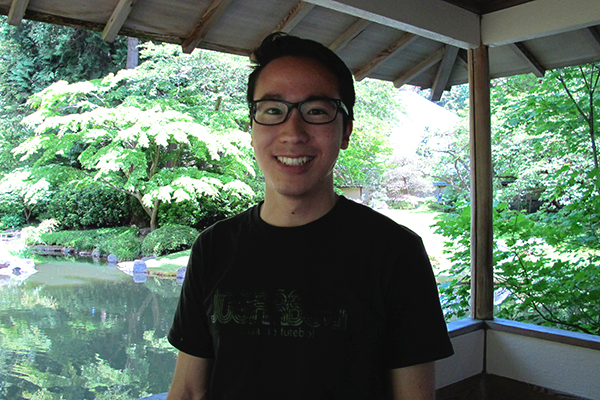 We’ve agreed to chat about the work he does at Nitobe Memorial Garden, the internship that got him here, and how this experience has helped shape his plans for the future. 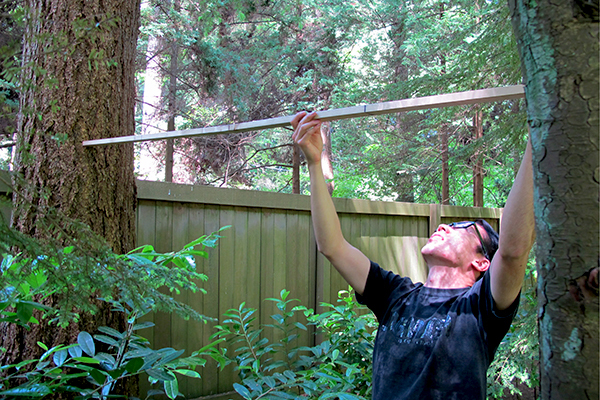 Yu measures tree branch lengths at Nitobe Memorial Garden. It turns out that while tree measuring is a common activity for him these days, he also partakes in many of the same duties Ryo does—most importantly, maintaining the Garden’s traditional Japanese character through relentless manicuring. “I study forestry at the Tokyo University of Agriculture—my major is not horticulture or landscaping—but I’m so interested in working at Nitobe and getting to practice horticulture-related activities” he says. 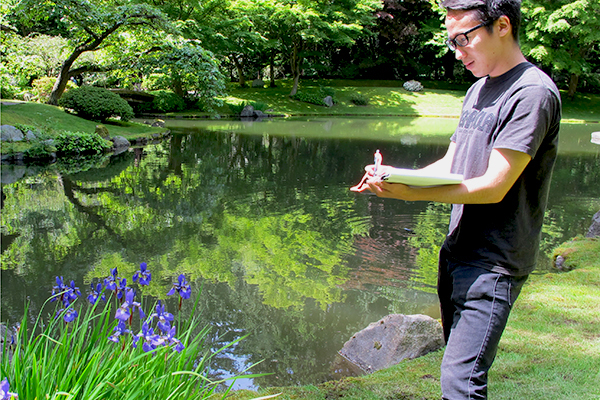 Yu is this year’s recipient of the Ian Gillam International Exchange Fellowship, given to outstanding students interested in expanding their research with hands-on experience at Nitobe Memorial Garden (it also includes a horticulture component), and has been working there since April. There are other internships available too, which take students to different areas of UBC Botanical Garden, and they are all a part of the Garden’s commitment to fostering research and inter-cultural cooperation in order to combat the negative effects of climate change and the loss of biodiversity currently happening across the world. The internship is research-oriented and allows students flexibility over what to focus on. His ultimate research goal as part of the internship is to create a 3D map of all the trees at Nitobe, which he hopes will help illustrate the interactions between trees in the Garden. “My research focus is the tree structure of the Garden—by surveying and mapping the tree structure inside Nitobe, I will show the complex relationships between the trees. I’m also examining the implications of future urban forest management, and evaluating the landscape and aesthetics based on Japanese beauty and “Wa”—the idea of peace that Japanese culture has to be based on” he says. Yu measures one of the many conifer trees at Nitobe Memorial Garden. As a forestry major, Yu is used to working in close proximity with nature and hopes to remain in this type of environment in the future, and he credits the internship with reaffirming a passion for sustainability and conservation. “This internship reminds me of how important saving nature and the environment is—in the future I could see myself heading towards studying conservation because I want to contribute to keeping the environment clean and helping reduce global warming.” As we part ways, I pass over the 77-log bridge, which was meant to represent Nitobe Garden founder Dr. Inazo Nitobe’s desire to be “a bridge over the Pacific.” It seems that mission is growing stronger every year thanks to programs like the internship, and bright young minds like Yu who carry it forward. Yu will complete his internship in July before heading back to Japan. Just the way Yu are!